Tech Dreams: Netscape Navigator Will Be Laid To Rest On Feb 1, 2008. You Are Requested To Observer Silence. 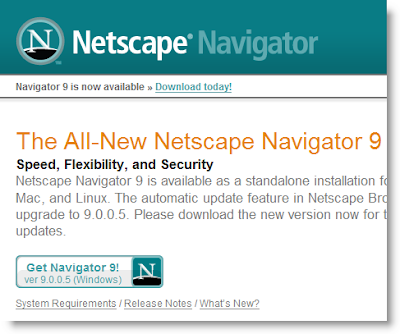 Netscape Navigator Will Be Laid To Rest On Feb 1, 2008. You Are Requested To Observer Silence. All the Internet users are requested to observe a minute of silence on February 1, 2008 as the Netscape Navigator will die on that day. Netscape launched the commercial Internet browser Netscape Navigator on Oct 1 2004 and AOL acquired Netscape in 1998 for $4.2 billions. Yesterday AOL announced ceasing of development and end of customer support on Feb 1, 2008. The recent surveys suggest that Netscape currently has only 0.6% market share, compared to Internet Explorer's 77.35% and Firefox's 16.01%. In 1990s Netscape enjoyed 90 percent of the market share and gave very tough competition to Internet Explorer. Netscape has been an outstanding product and I wish you well.